Think of a stereotypical 'economist' and you’ll probably come up with a mundane image of someone parked behind a desk. But Dr. Jamie McCasland’s career path has been anything but boring. The assistant professor at the Vancouver School of Economics has done grassroots volunteering abroad, conducted field research in Africa and most recently, advised on former US House Representative Beto O’Rourke’s Senate campaign in Texas. 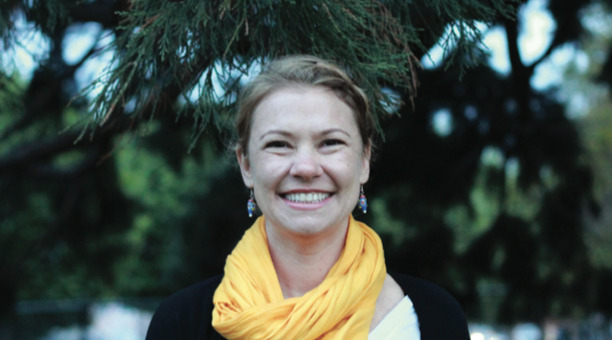 McCasland moved to Kenya as part of the US Peace Corps, helping mostly with their reproductive health education sector. Working in a low-income country as a self-described “critical and rigorous” person got her thinking: were the programs being implemented there actually working? “I transitioned into a role as a researcher because I was looking for something that was a little bit more focused on ensuring that we have an evidence base for the kind of programming that we were doing,” she explained. She moved back to the US and completed her PhD in economics at the University of California, Berkeley in May 2015, with a focus on development economics. She has since spent years conducting field experiments in Kenya, Uganda, South Africa and Ghana. Almost four years ago, she started teaching at UBC. “I really appreciate that part of the job [at UBC] is to interact with students and to inspire people to think a little bit differently about policy and their everyday lives,” said McCasland. And she’s also taken her own advice. In 2018, McCasland received an exciting offer from an old friend and long-time colleague: take some time off from teaching and come work on an American campaign trial. She didn’t hesitate. “I’ve always been really interested in policy and politics. And that was kind of the primary motivator for me … I’ve always wanted to participate politically and have in more minor ways, but I think, like many people after the 2016 election, I was particularly motivated to find some way to use my expertise to contribute,” she said. As someone who lived in Texas as a child, O’Rourke’s campaign felt like a great place to start. O’Rourke ran to represent Texas in the United States Senate in 2018 as a Democratic candidate against incumbent Republican Ted Cruz, to whom he narrowly lost. McCasland worked as an economist on his campaign, analyzing policy choices of O’Rourke’s — like his proposal to raise the national minimum wage to $15 and its potential effect on inflation — as well as making recommendations and occasionally presenting alternative policy options. What is less easy is being a woman in a male-dominated field. McCasland carefully interrogates her gender identity both as she experiences it and as others do, acknowledging that the field of economics is a long way from equity. “It’s a salient identity for me ... it’s something that is kind of constantly in the back of your mind: that you are a woman economist, and there are very few of you,” said McCasland. McCasland noted that this point doesn’t just stand for women’s representation. There are many minorities that are even more “extremely underrepresented” that the discipline is still very much closed off to, and she thinks academia only gets better when we let those voices in. In February, during her interview with The Ubyssey, McCasland didn’t rule out working in political spaces again. While O’Rourke didn’t win a Senate seat, many dubbed his narrow loss (2.5 per cent) to Cruz as historic, given that it took place in a dependably red state. McCasland, too, was optimistic about how the race went. “Arguably, you know, we might see a kind of different political outcome in the next election, or the one after that … it got some people really excited to participate politically,” she said. And on March 13, O’Rourke announced his 2020 presidential bid. While McCasland couldn’t comment on whether she will be working on that campaign as well, whatever comes next for her won’t be dull — and teaching at UBC is still new, and exciting and full of opportunity. “Tenure would be fantastic,” she laughed.